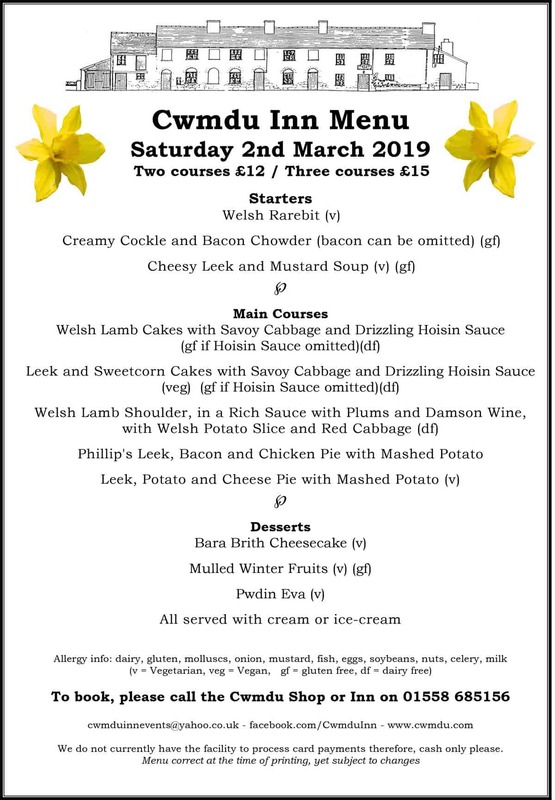 Saturday 2nd March menu at the Cwmdu Inn. A couple of Welsh lamb main course options along with delicious sounding vegetarian options. Cwmdu is convenient for dining out on Saturday night coming from Llandeilo, Talley, Salem and all of our other local villages. We look forward to seeing old friends and regulars along with people new to the Cwmdu Inn community dining night. Bookings appreciated and recommended. For menu, chef information and booking, please contact the shop/pub on 01558 685156.